in Canon City. More than 100 attendees enjoyed the informative presentations, vendor exhibits, and lunch at Holy Cross Abbey. The presen﻿ters generously provided copies of their slides and notes for reference. Feel free to download them for personal use only. 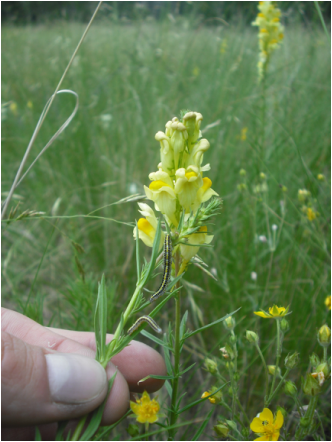 Yellow Toadflax (Linaria vulgaris) with larva of predatory noctuid moth (Calophasia lunula) feeding on leaves.